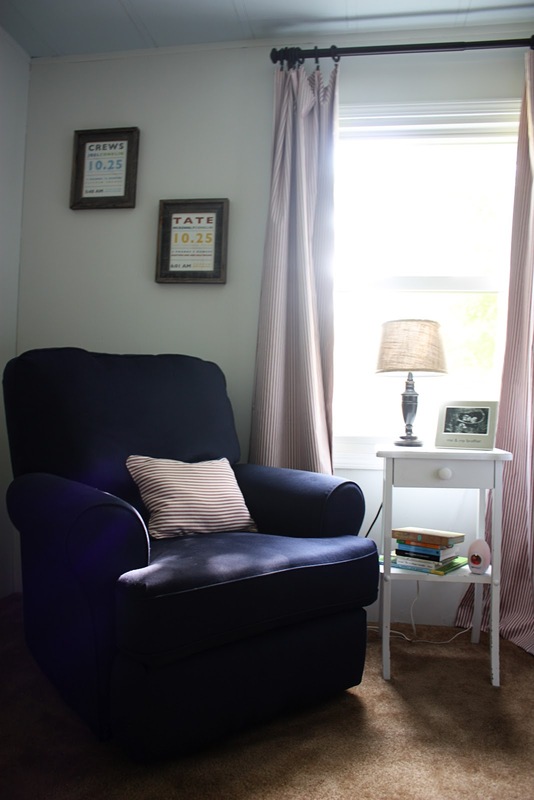 moxie made: the twins' nursery. 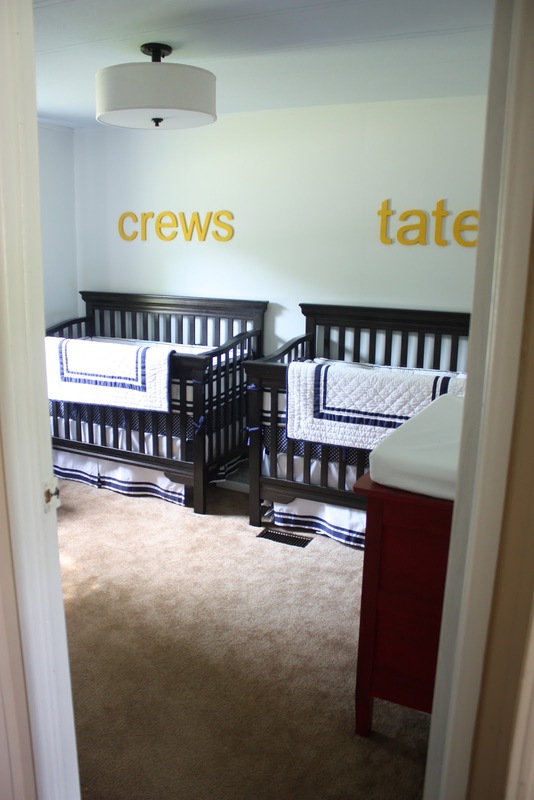 When I found out we were having twins' I spent the next few months trying to figure out the nursery. 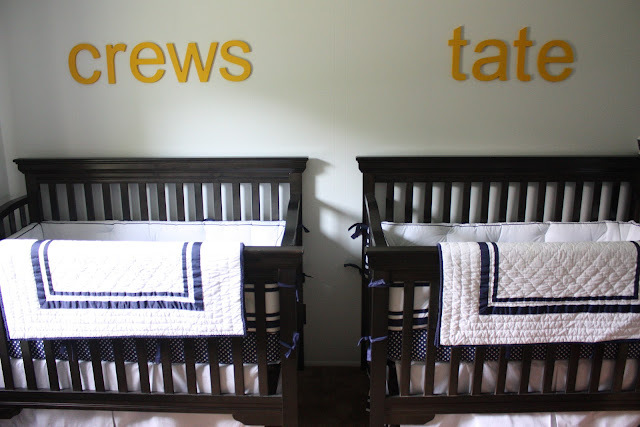 I looked and looked for a twins nursery online that I really liked but I had a hard time finding some examples from which to draw inspiration. After being at a standstill for quite a few weeks, Jordan actually picked out the bedding and we went from there. I'm finally getting around to posting pictures! And then, if you take a step inside, this is what you see. I really wanted to love this room. I wanted it to be right. But I also didn't want to break the bank trying to get it the way we wanted it. So, we found some things on sale, made some things, used some old furniture and then spent the money on the things we felt like were worth splurging on. We were able to find the cribs on clearance at Target and we bought the bedding while it was on sale from Pottery Barn Kids (and got a twins discount!). We actually had to drive to multiple Targets to find the cribs. We bought two from our Target and then got them home and put them together and the colors looked different. They were both named the same color and both were a brown-ish color but the difference was significant enough that we packed up one of the cribs and took it back. Then, we drove to three other Targets before finding one with a color that matched closely enough that you couldn't tell the difference when they were side by side like these would be! We ordered out letters from CraftCuts and were very pleased with them. They are so expensive at PBK or other baby stores. But, this website allows you to choose the font, size and thickness of your letters. I loved all the options there were and it was a lot less expensive! Somehow the nursery turned nautical, which was not my intent. But, as it came along, I fell more in love with it. I wasn't going to go with red. But, I couldn't come up with another color I would like with the navy that also looked "boy enough" [a big concern for Jordan :)]. My mom and I made the curtains and the pillow for the chair. I knew I wanted a pillow that matched the curtains and I wanted it to have navy piping. So, my mom came up with a genius idea. She had an old pillow with navy piping and an embroidered front. So, instead of making a pillow from scratch and putting the piping in, we just cut the material to fit the front of the pillow and ironed the raw edges under. Then, we just top stitched around the edge of the already-made pillow with red thread and navy bobbin thread. It worked great and it was like a 15 minute project! Jordan picked out the "My Brother and Me" picture frame. We put the only ultrasound picture we have that shows both babes in the same frame. I love this picture and wanted it displayed in their nursery. I designed and printed the birth detail photos on the wall above the chair. I got the rustic, wooden frames from Hobby Lobby. We bought the lamp at Target and Jordan's mom got the little white table at a yard sale. It looks distressed but I liked it so we left it that way. One of our splurge items is the glider/recliner. It's a Best Chair that my parents bought us as our baby gift. I am absolutely in love with it. It's so comfortable and I know it will last through all the babes (yes, we hope to have more - but not for a few years :)) and will probably take up residence in our bedroom or the family room once it has served it's purpose for the babies. 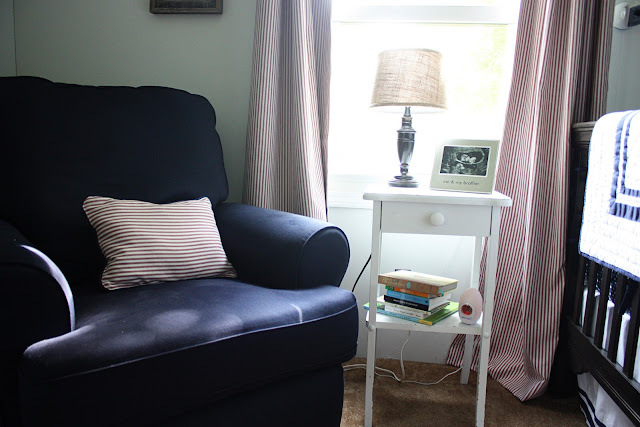 We ordered it at a local boutique but we were able to get it during a 15% off sale and we were able to get a $50 credit for every $500 spent so we were able to get some additional money towards other merchandise when we purchased the chair which was great! Our changing table is opposite the window. Jordan's parents actually bought us an old antique dresser from a little store and we asked one of their family friends to fix some tracks for the drawers to slide on (since it was difficult to get the drawers open). But, we mentioned that we were planning on painting it and he couldn't stand to see an antique with nice wood "go to waste". So, he made us a dresser that looks exactly like the antique and we painted it instead. And he decided to keep (and then donate to his church) the antique dresser. We painted the dresser a bright red and then Robin helped us wipe it down with an acrylic paint (Burnt Umber) from Michaels. We had the most difficult time finding a white changing pad cover. I guess that's not the best color for changing dirty diapers but there wasn't another color I liked. 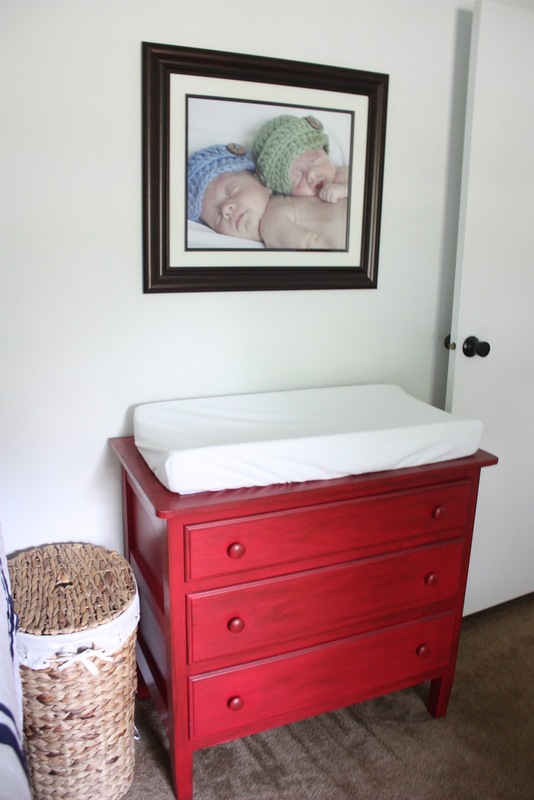 Actually, I've contemplated just making this a dresser without the changing pad even on there. I can count on one hand the number of times I've actually changed a baby on this thing. It's just not practical when you have two. It's much easier to just lay a blanket down and get on the floor and do both together. Courtney took the twins' pictures and I got a large one printed and bought a frame from Michaels when they were 50% off, not long ago. The frame is like 16x20 or something like that. I love that it's a huge picture of their sweet faces when they were so tiny! The last thing is the wall in between the two closet doors (opposite the cribs). Jordan saw these toys at BuyBuyBaby and was so excited about them! 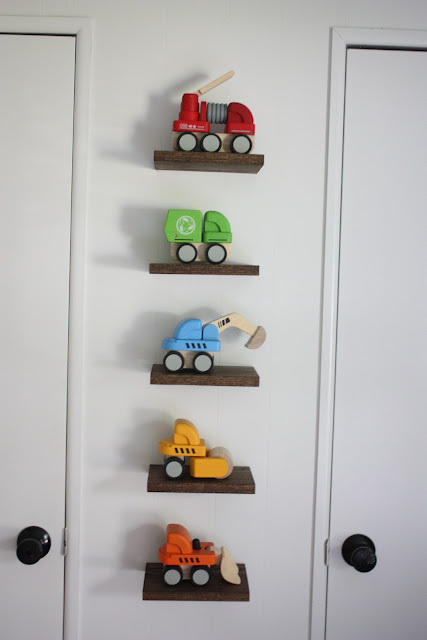 He built and stained these floating shelves to display the toys. It's a way of adding a little "boy" and a pop of color. We both love this wall! 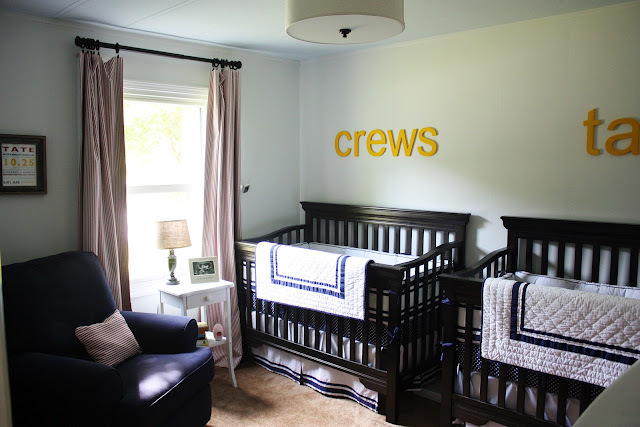 I hope you enjoyed the nursery tour :) I'm excited to finally be sharing it here! 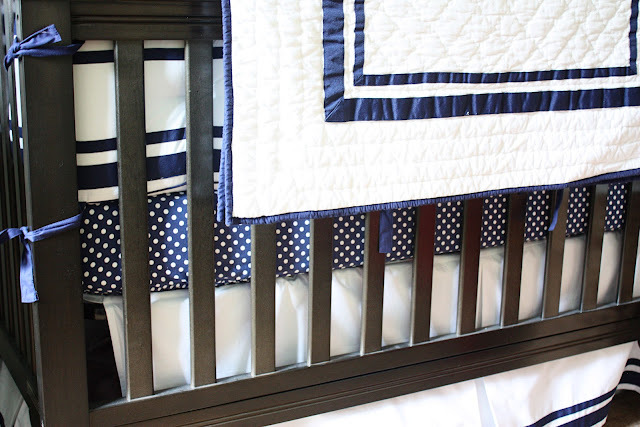 A list of all the items in the nursery and where they were purchased can be found below! Please let me know if there is anything I leave out that you're curious about! I'm actually using similar bedding from pottery barn for Jack's room. I just love navy and white together. The construction trucks are a great addition to the room! you did such a great job!! i love it! Love it! My favorites: the big picture of the boys and the construction trucks. Well, I love their names above their cribs and the birth details too!! By the way, the ceiling paint is SWEET BLUETTE by: Benjamin Moore!